Our nation’s symbol, this powerful bird of prey almost went extinct. It has rebounded in recent years, with the Minnesota-Wisconsin border hosting one of the most successful recoveries. Fish, ducks, and dead animals (carrion) such as deer. Forested areas near water. In Minnesota, bald eagles nest mostly in the central part of the state, and in winter they can be found along the Mississippi River. Bald eagles nest and hunt along the waterways. A few migrate, but many prefer to winter in Minnesota, hunting for fish in ice-free stretches of river. Recovering but still protected by law. By 2006, 1100 pairs of bald eagles nested in Minnesota, up from only about 480 in the entire United States just 30 years earlier. This female bald eagle is on loan to the Minnesota Zoo from the U.S. Fish and Wildlife Service. She was found in 1997 in Wisconsin suffering from a broken wing and lead poisoning. After being taken to the University of Minnesota Raptor Center, veterinarians discovered her wing injury was old and had healed in way that made fixing it impossible. Because she would never be able to fly, she could not be released back into the wild. After a year of care at the Raptor Center, the eagle came to live at the Minnesota Zoo. Although we are not sure of her exact age, this eagle was in adult plumage (feathers) when she came to the Minnesota Zoo in 1998. That means she was at least 4-5 years old at the time. She has been here for more than 14 years, which means she is at least 18-19 years old. Where to see her: Medtronic Minnesota Trail. Bald eagles are usually found near water. Golden eagles prefer open rangeland. Golden eagles are not native to Minnesota, but may visit parts of the state in winter. Young bald eagles lack feathers on their lower legs (tarsi). The white mottling on their head, body, wing linings, or tail feathers appears “dirty” white, rather than clean and crisp like mottling on the golden eagle. On June 20, 1782, the bald eagle was voted our national symbol. Today, twelve states include the bald eagle on their official emblems. Eagles re-use nests and add to them each year. Well-established nests may grow as large as 10 feet across, 20 feet deep, and weigh over 2 tons! 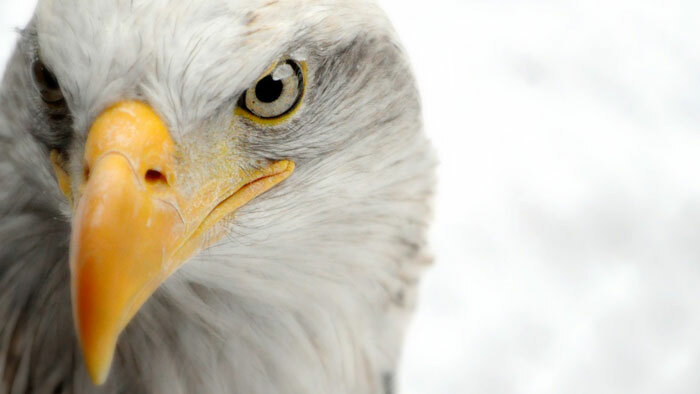 Because bald eagles occasionally “pirate” food from other species, Benjamin Franklin thought they were of “bad moral character” and a bad choice for our national symbol. He suggested the wild turkey instead. Being called “eagle eye” is a compliment. 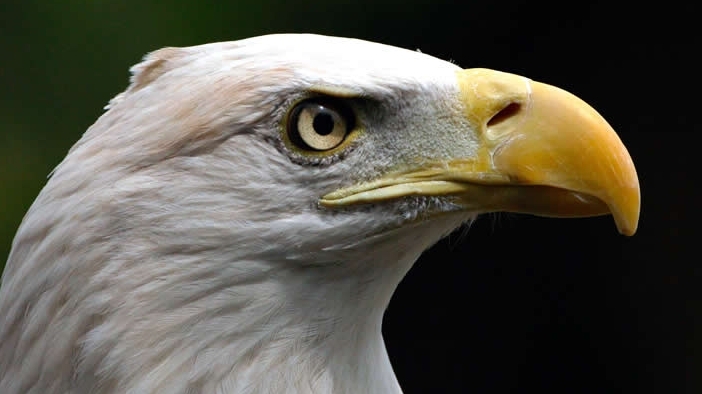 Like all raptors, bald eagles have keen vision-at least four times that of a person with perfect vision. 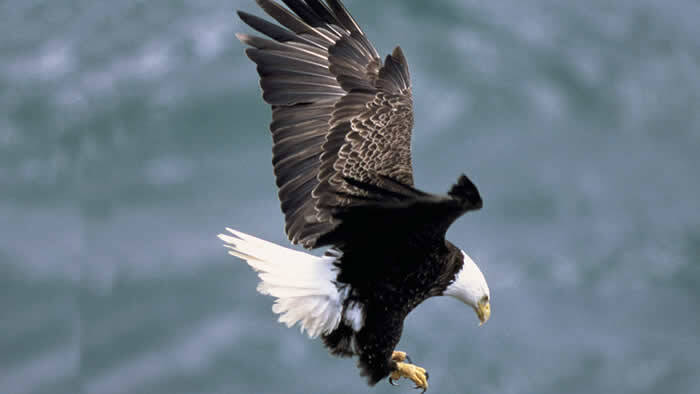 Bald eagles can fly to altitudes of 10,000 feet, and reach speeds of 50 mph when hunting and 100 mph when diving! As a result of habitat destruction, illegal shooting, pesticides, and poisoning, bald eagles were once endangered or eliminated throughout most of the lower 48 states. On June 28, 2007, after 40 years of successful conservation efforts measures, the American bald eagle was taken off the Endangered Species List. At the time of delisting in 2007, there were an estimated 10,000 nesting pairs in the lower 48 states, with 1500 pairs in Minnesota. Bald Eagles are still protected by the Migratory Bird Treaty Act and the Bald and Golden Eagle Protection Act, making it illegal to kill or possess an eagle (dead or alive) or any of its parts (including feathers).